Train journeys have fascinated me ever since I was born. And for some reason, even after 23 years and uncountable train journeys, if I spot a train somewhere unexpected, I would cry out loud in excitement. No wonder, trains have seen a prominent presence in so many of my blog posts. It’s a Saturday night in early September and I am sitting comfortably on the side-lower berth. My bedding is ready and most of the compartment lights have been switched off. 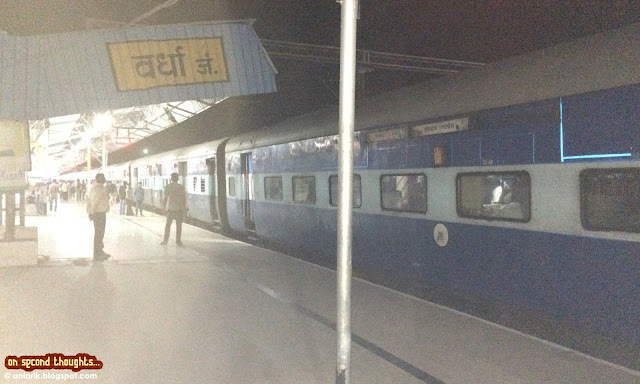 Going by usual Indian train etiquettes and timings, 11 PM is very late and people are already midway through their sleep schedule. But train or no train, I doubt I can ever go to sleep this early. As per plans (since the moment I noticed the side berth had a laptop charging point), I should have been watching another episode of Suits Season 5, but events of the last couple of hours resulted in me sitting calm and writing this entry. that relies on these signposts to head to their destinations! A few minutes after 9 this evening, my train arrived at Wardha. My ‘link’ train from Balharshah waits here for 1.5 hours for the ‘main’ train coming from Nagpur. The two trains then connect and proceed on the journey to the destination together. For an Indian train to have a 1.5 hour long scheduled stop is uncommon, and probably only links like these demand such huge time gaps ‘to be on time’. My train started moving all of a sudden and quite fast. I realised only 6 bogies were being hauled by the engine instead of the usual 20 or more, and hence the speed. My bogie was in fact the very last one now. As I stood at the door, the train went out of the station for about a kilometre and came to a sudden halt. A minute later, the train started moving in the reverse direction and into a different platform where the ‘main’ train stood waiting for the ‘link’s arrival. About 10 metres from the main train, my train came to a halt. I got down and rushed to the 10 metre distance. Slowly the link started moving and with a slight bump to the main, came to a halt. My train had arrived here as a slow moving passenger. It left as a superfast express. The Wardha Bond had been forged. 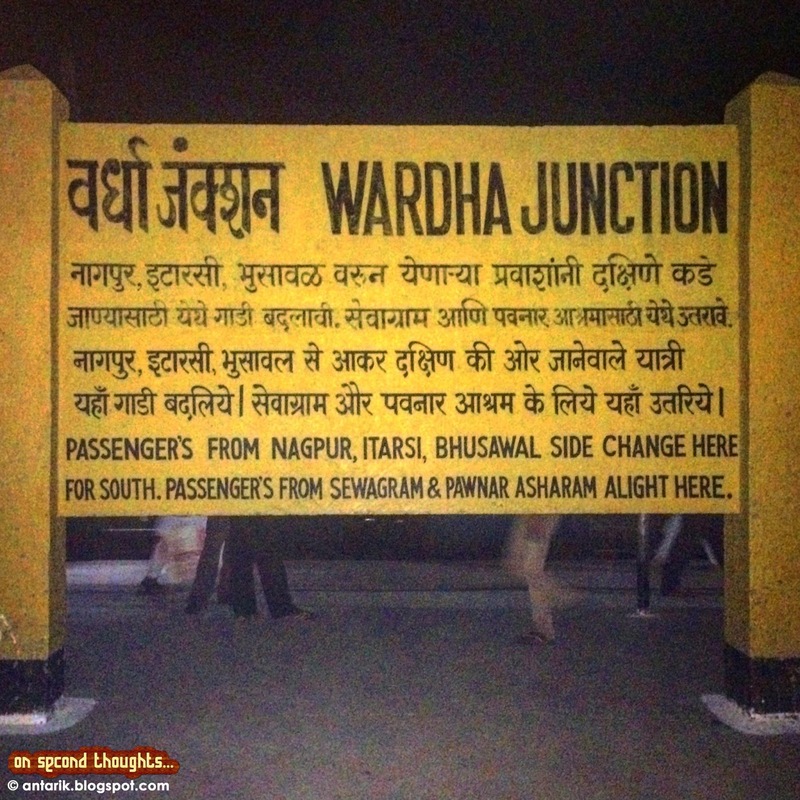 The Wardha Bond is forged! I finally took my seat and started typing this blog entry. I usually prefer the side upper berth in trains, but owing to the absence of any old people in the lower berth and the fact that I prefer a window seat, I exchanged my berth with the lower-berth holder. It all probably isn’t very interesting to read, but the way the railways work in India has always fascinated me. What else would justify my choice of taking a ‘local’ train ride from my destination station to my flat in Mumbai tomorrow morning? I guess, even this post will be up once I am home and have a working internet connection; Indian Railways still has to work on this part. Wrote this a few days ago, on my way to Mumbai. Posting it so late, for no particular reason. 1. Hey, little train! Wait for me!